I looked at an RW2 the other day with an E6-350 engine and a Maxitorque 9 speed. This was a supposedly-unmolested, original 300k mile truck. On the drivers side of the hood it had a Maxidyne emblem. The passenger side was not drilled for an additional emblem. I didn't think Mack put 9 speeds behind Maxidyne engines. True? See engine tag photo. Something didn't seem quite right to me. Perhaps the hood has been changed? By the way, did they put the Maxidyne and Econodyne emblems on both sides of the RW2 hood.... or only the drivers side? Thanks! I've never seen emblems on the side of an RW hood originally except "Mack", V8, and the emblems calling out the E9-500. Never have seen "Econodyne", nor "Maxidyne" on the hoods of the RW series. I'm only speaking for myself. The E6-350 is not a "Maxidyne" series engine however. I/we have repaired, rebuilt, replaced many "RW" series hoods through the years and I've never seen emblems applied to only one side of the hood and again speaking for myself only. Seen trucks with none or both sides or just driver's side. I asked Dave Igou about his E9 years ago and only having the left Econdyne emblem. It was the way it was built. Guess it depended upon union relations, whom was at work, whom was home sick, available stock on any day the truck was built then. Seems like a strange way to do it but Chrysler only placed their Pentastar emblems on the lower right front fender of their vehicles for many years too. E6-350 gathered with 9 speed Maxitorque T2090 is a quite common combo. It worked very well together too. Didn't matter on, or off road, the gearing in the rears put that engine/trans combo right where everything needed to be. Good low, and good high ranges for most any task. That engine is an Econodyne E6350 if it's a 4valve head. For it to be a Maxidyne it would read EM6.... I believe the 4 valve 350 was not available in Maxidyne config. Lower the 350hp ratings such as 300 were available as Maxidyne in E64V ratings. My 1988 has a factory installed Econodyne label with studs under the Mack script on the driver side only which was common for RWs. Same for Maxidyne if your truck was powered as such. Interesting. I was thinking the E6-350 didn't come in Maxidyne flavor but wasn't sure. Yes, this emblem had studs through the hood. Wonder if someone just changed out the Econodyne emblem for a Maxidyne one. The whole thing just didn't seem right to me for some reason. So can anyone tell if this engine is an Econodyne version or not? 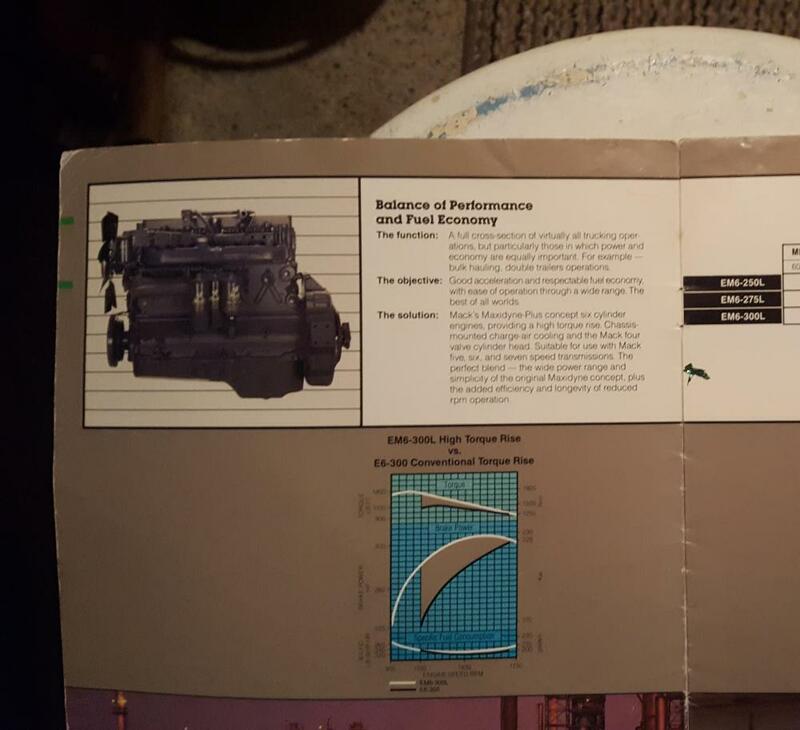 Refresh my memory.... Econodyne had a lower RPM range than the standard engines? The engine in the picture is an Econodyne not a Maxidyne. You could order an RW with a Maxidyne engine which I have seen before. It could go either way, engine hood name swapped or powertrain in truck. Best to get the VIN number and look up the spec at the dealer. The Econodyne had a lower torque rise percentage for on highway useage. The Maxidyne had a high torque rise percentage and was more suited for vocational off road use. Maxidyne were usually speced with 5, 6 or 7vspeed transmissions while Econodyne engines normally had multi speed transmissions of 9 gears and up. Lower the 350hp ratings such as 300 were available as Maxidyne in E64V ratings. My '90 RD690S had an EM6-300L in it and driver's side only "Maxidyne" emblem on it. My '88 RR690ST has the same powertrain in it, but has the "Econodyne" emblem on it. I know of one Super-Liner built around the time of my '90,that had a "Maxidyne" emblem also. Don't ask me why,had dual stacks and quite sure it didn't he EM6-300L like my truck did.Was always a mystery to me too! Maybe kscarbel can shed some light? But they all were Econodines not Maxidynes. I'm not 100% sure though there were 4V EM9 Maxidynes for example. In 1988 they switched from offering 2V engines for Maxidyne engines to 4V engines. In Mack Sales literature it was rebadged as "Maxidyne Plus"
The only one that kept 2V Maxidynes were DMMs because until 1992 they were built without chassis mounted charge air coolers. In 1992 they switched to EM7 engines with the new DMM hood design. Wow! Thank you for the lesson. The thing that messed me up was I thought 250, 275 and 300hp versions were only 2 valvers. In 1988 they switched from offering 2V engines for Maxidyne engines to 4V engines. In Mack Sales literature it was rebadged as "Super Maxidynes"
Indeed there were EM7s so EM6-4V should be as the predecessors too. On a side note were any DMM's assembled at Oakwille? DMMEX was actually engineered by Mack Canada Oakville and i would guess over 90% DMMEX units were built in Oakville Assembly. I remember standing in between the steer tires as a kid at the plant in awe. Yes the engine emblem is only on the drivers side on any RW that I have seen including mine. 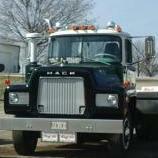 The Mack script and Superliner emblems are on both sides. The RW hood is drilled and counter bored through the secondary fiberglass support on the inside of the hood but only on the drivers side. I got 2 new Econodyne, as an E9-500 is an Econodyne engine, emblems to put one on each side when repainted but will only use one as I suppose Mack always intended. The hard to find NOS V8 emblem, in chrome, will however be on both sides but were not original to a 1988 RW. Might have been a sin but I had 2 NOS Gold V8 emblems show chromed for the RW. If I remember right the Gold V8 and Dog emblems were for Maxidyne engines originally. Later for the Elite package. Also remember when those V8 emblems were $65 for chrome and $95 for Gold from Mack back around 1995 and I thought that was crazy.